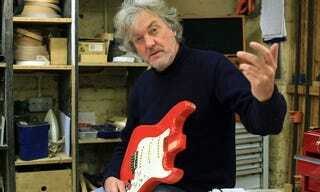 James May has completed the last of his three reassemblings tonight with the 147 pieces of an electric guitar. -Japanese companies used JIS screws instead. They’re nearly but not quite the same which is convenient as JIS screwdrivers aren’t easily to be got in Europe. James, being James, has several because he’s in the habit of working on 1960s Japanese motorcycles.